Now that Hatch Chile season has started, we’re excited to share more recipes from Melissa’s Hatch Chile Cookbook. We can’t get enough of these amazing chiles and we hope you enjoy them. Don’t forget, the season for Hatch Chiles isn’t a long one so you’ll want to stock up so you can enjoy these bad boys all year round. Prepare a grill or broiler to high heat. Lay 1 tortilla on a large plate or flat work surface. Sprinkle with half of the cheese and half of the chiles. Cover with another tortilla and set aside. Repeat for the remaining 2 tortillas. Carefully transfer the filled tortillas to the grill and cook, turning once, until they are nicely marked on both sides and the cheese is melted, about 2 minutes per side. Cut each quesadilla into 6-8 wedges to serve as an appetizer; leave whole to serve as 2 individual portions. Serve with Mollie’s Own Salsa. Be sure to share your favorite Hatch Chiles recipes with us in the comments below! 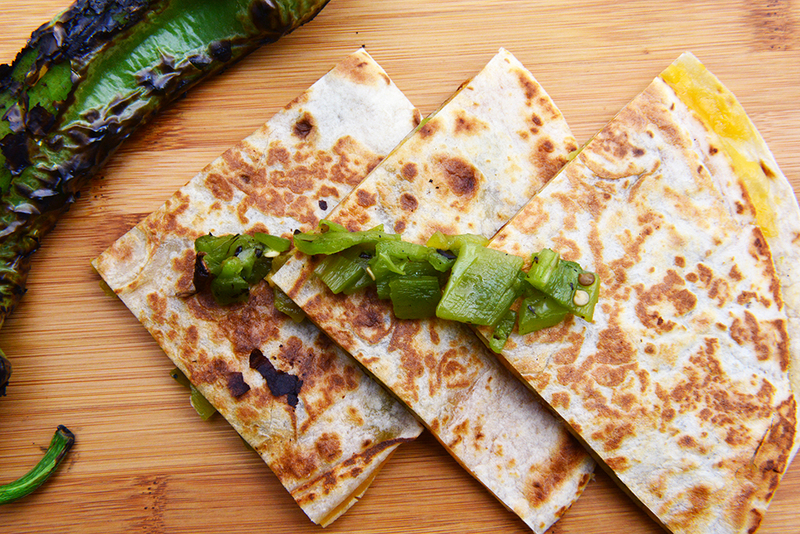 Share your Hatch Chile Grilled Quesadilla photos with us by posting onto our Facebook page or using the hashtag #CookingWithMollies on Instagram or Twitter.